Home | US 2050: What Will America Look Like at Mid-Century? US 2050 is a new joint initiative of the Peterson Foundation and the Ford Foundation examining the demographic, socio-economic, and ﬁscal trends that will shape our nation in the decades ahead. 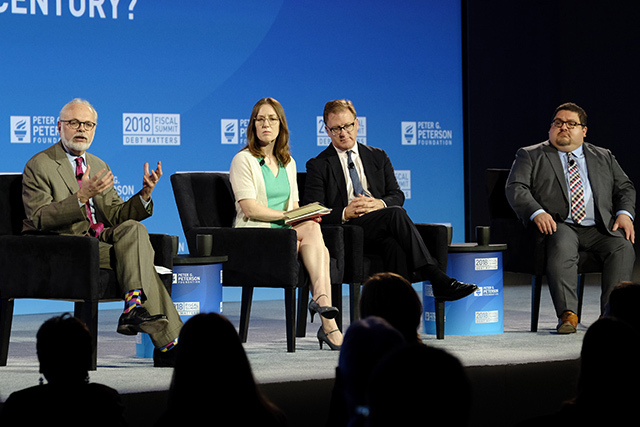 This Fiscal Summit panel brought together four of US 2050’s Advisory Board members to discuss their work to build a comprehensive view of our economic and ﬁscal future — and the implications for the social and ﬁnancial well-being of Americans. David Wessel, Director of the Hutchins Center on Fiscal and Monetary Policy, Brookings Institution, led a discussion with his fellow board members, Heather Boushey, Executive Director and Chief Economist at the Washington Center for Equitable Growth; Robert Doar, Morgridge Fellow in Poverty Studies, American Enterprise Institute; and Mark Hugo Lopez, Director of Global Migration and Demography, Pew Research Center. Wessel opened the conversation by describing the goal of the project as laying the “intellectual foundation” for exploring how the changing demographics of America — including aging, race, ethnicity, and other factors — aﬀect the future ﬁscal and economic health of the nation. Through US 2050, Wessel noted that research is getting under way to connect the dots between a number of interrelated issues and trends — including labor force participation, education, immigration, fertility, health status, caregiving, family structure, retirement savings, and political institutions. Explaining the demographic shifts under way, Lopez pointed out that “we know, to a good extent, what the nation’s population will look like in 20 years,” which will be increasingly diverse. With significant variance in education, poverty, and health, for example, among different racial and ethnic groups, it is essential to understand the implications of these changes, according to Lopez. He noted that population projections can change over time, especially given changes in immigration patterns. Fifty-nine million people, he said, have entered the United States since 1965 as immigrants, an influx that has been a key driver of population growth overall and has significantly changed our racial and ethnic composition. Making the connection between changing demographics and a strong future economy, Boushey highlighted productivity growth as a critical factor in how the country will be able to adapt and respond in the years ahead. She noted that in coming decades, we will have fewer workers per retiree. “We should be especially worried,” she said, “if we’re not seeing productivity gains … because what’s going to make or break the living standards of the elderly is how productive those cur-rent workers are.” She also identiﬁed large diﬀerences “across communities and across families in access to education” as problematic in exacerbating the outcomes of inequality.